* Due to the nature of our work, we are often not on site. An appointment ensures our availability to give your session our utmost attention. Whether you are a native Houstonian or you got here as quick as you could, we can all agree that Houston has grown very rapidly. With the rapid growth, our skyline, business districts, neighborhoods, and literally right down to each street corner have changed dramatically in appearance over relatively short periods of time. Have you ever stood on a downtown street corner and wondered what it may have looked like in the late 19th century? Maybe you live in the historic heights area and wonder what the original Heights Hospital looked like. Perhaps as you are stuck in traffic coming in to work downtown, you wonder what the skyline looked like in 1930. Perhaps you are a sports fan and never realized that there had been a baseball stadium near downtown long before Minute Maid Park. Imagine what the ship channel looked like in the early 1900's. It is with this in mind that TurnKey Art Solutions offers an art product that literally ties the old Houston with the new Houston in one quality, custom piece of art that can add a special touch to your home or office. We offer a "street corner" view of virtually any major area of Houston at a point in history as well as the current day view. This framed art piece includes a vintage black and white photo of an area of Houston at a chosen point in history. Additionally, it includes a color photo of the same area in today's setting. It also includes a short description of the area and the time in history. 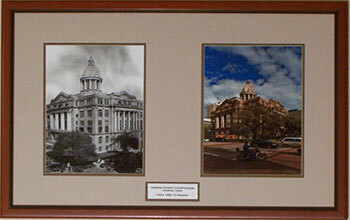 Many of our clients like to only frame a historical Houston "street corner" view without the current view. That is also available. To bring an additional vintage look to your office, we offer a selection of old Houston and old Texas maps. These bring a special look on their own, or enhance the appearance of the "street corner" views you have selected. Everything on this art piece is custom and is selected by the client. The photos, frame, mats, and glass are all selected with the assistance of a trained professional that will come right to your office with photo as well as framing choices. TurnKey Art Solutions is also available by appointment at our Cypress or Galleria/Katy Freeway area locations. Come shop for original art, prints, and custom framing. Please call 832-606-3303. © TurnKey Art Solutions. All rights reserved.